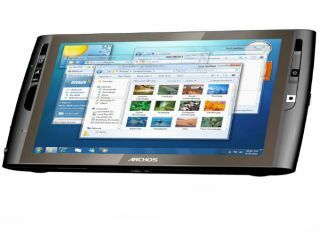 Archos today launched the Archos 9 touchscreen tablet, an Atom Z515-powered, Windows 7 device. At an event in Paris, Archos unveiled the "under 800g" device that eschews any kind of keyboard in favour of full touchscreen operation. The resistive touchscreen lets you use a stylus or finger on its virtual keyboard while optical tracking enables smooth scrolling and cursor placement. The specification is nothing extreme: webcam, hard drives up to 120GB, Bluetooth b/g wireless and twin digital TV tuners, although Engadget is also reporting a clock speed of a modest 1.2GHz. The Archos 9 will be available in the autumn, alongside a similar 12-inch version. Pricing for neither has been announced. Archos also showed off its 10s Moorestown netbook and a low cost (240 Euro) educational laptop for French schoolkids. The Archos Digital Satchel is aimed at 4-12 year olds, has an easy-grip handle, shock- and water-resistant construction, builti-in Wi-Fi and links to online lessons. Finally, Archos returned to its roots with a brand new media player called the Archos 3 vision. This 3-inch touchscreen PMP has a 'virtual wheel selector' (thank God, as we can never decide which virtual wheel to buy), which apparently "provides a whole new browsing sensation." The 8GB flash player will also "easily fit in pretty much any kind of pocket." Which is nice to know.